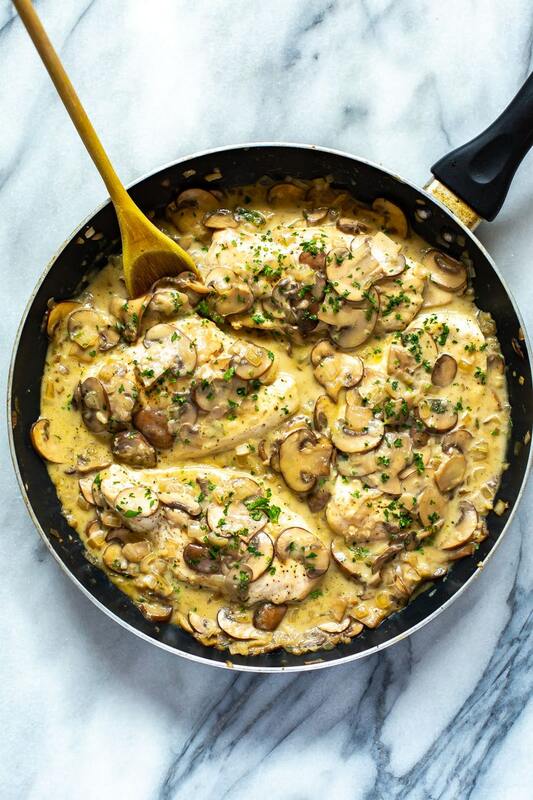 This Skinny, Easy Chicken Marsala Skillet is a delicious, creamy mushroom chicken recipe, made healthier with less cream and Marsala wine. It's a one-pan dinner that's freezer-friendly! Dry Marsala has a nutty flavor, so it’s best in savory dishes with beef, pork, chicken, and veal. It also helps to caramelize vegetables like onions and mushrooms. Sweet Marsala is best in dessert recipes or dishes with sticky, sweet sauces. 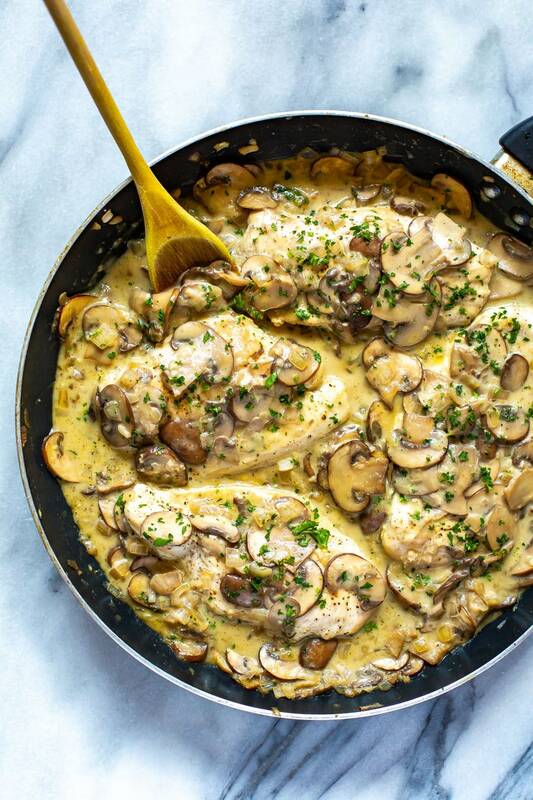 So, for this easy chicken marsala recipe, you’ll want to choose a dry Marsala wine. For the best flavor, don’t get the Marsala cooking wine from the grocery store. Instead, select a good quality dry Marsala from the liquor store. What can I use instead of Marsala wine? Dry red wine – Substitute 1/4 cup dry red wine plus 1 teaspoon of brandy for every 1/4 cup of Marsala in the recipe. Dry white wine – Use the same substitutions as listed in the red wine substitute, listed above. White grape juice – Substitute 1/4 cup white grape juice plus 1 teaspoon of brandy for 1/4 cup of dry Marsala. When you cook with alcohol, most of it evaporates during cooking. Still, some people prefer not to use alcohol at all. For a non-alcoholic Marsala substitute, combine 1/4 cup white grape juice with 2 tablespoons sherry vinegar and 1 tablespoon vanilla extract. 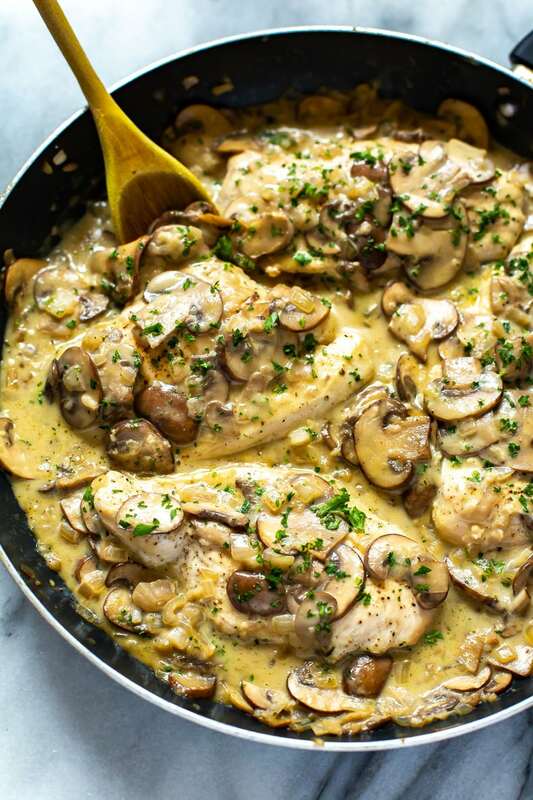 What Makes This a Lighter Chicken Marsala Recipe? To make this into a skinny version of chicken marsala, this recipe uses way less cream than the traditional version. You'll use just two tablespoons of heavy cream and if you prefer, you can even sub in half & half, milk or non-dairy milk. While this might impact the coloring and richness of this recipe, you'll still get all the flavour from the mushrooms and added onions and garlic. 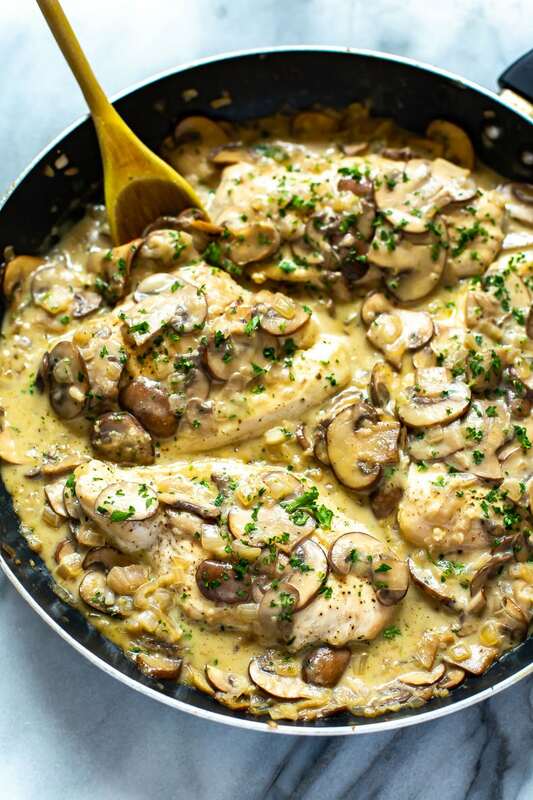 Typically you wouldn't add garlic or onions to a chicken marsala recipe but in the interests of controlling the calories and using less of the rich ingredients like the marsala wine and cream, it's better to add other flavoring agents that still result in a whole lot of deliciousness! What’s a good side dish to serve with Chicken Marsala? For a quick and easy skillet meal like this one, you have a lot of side dish options. Chicken Marsala is delicious with rice, mashed or baked potatoes, or buttered noodles. Quinoa is also a great option. 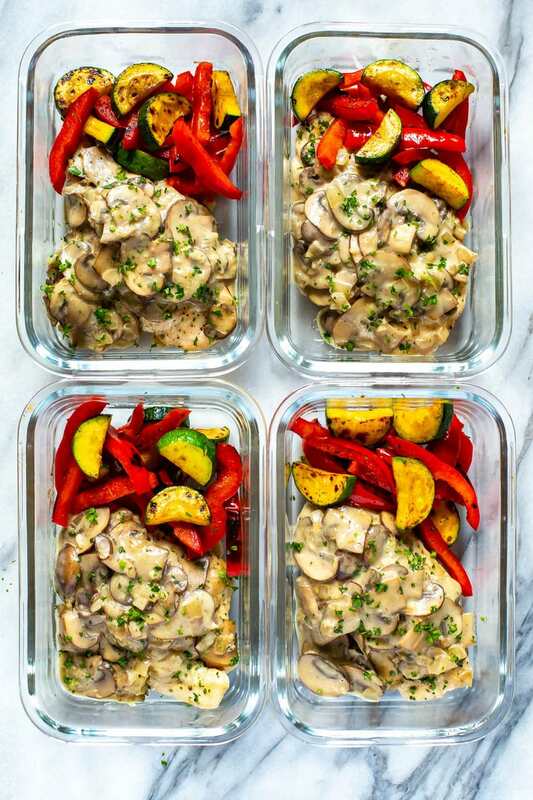 To keep the chicken Marsala dinner healthier, choose sides like cauliflower rice or broccoli rice, or even just a side of veggies like the zucchini and red pepper I have served up in these meal prep servings work well! Can you freeze chicken Marsala? Like many of my other skillet meals, this easy chicken Marsala freezes very well. 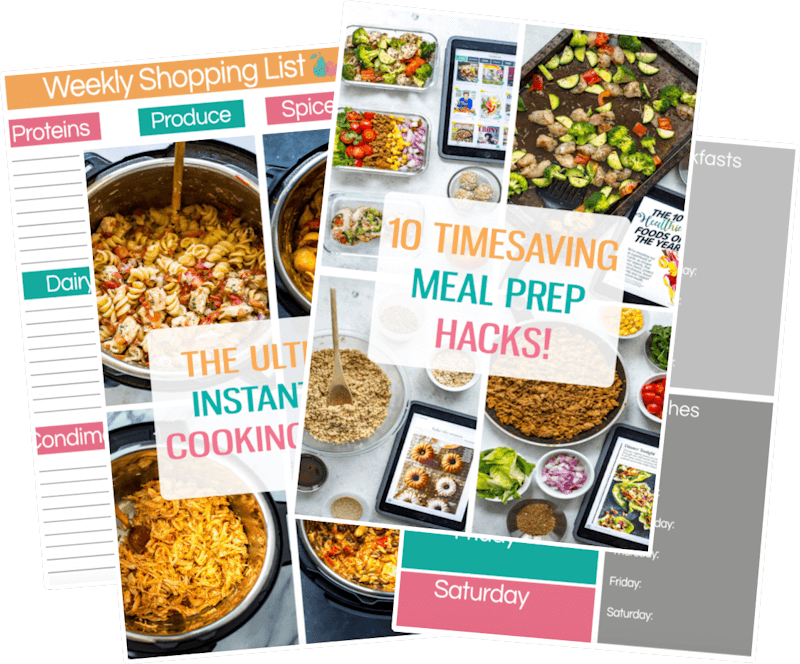 That makes it a great choice for a make-ahead meal and for meal prep lunches. 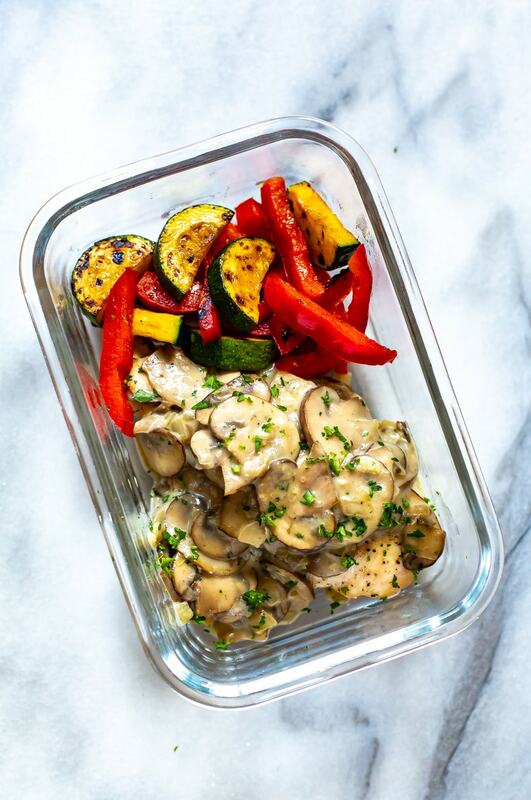 To freeze chicken Marsala, transfer the contents of the skillet into a freezer-safe storage container. A disposable aluminum pan with a lid works well, too. Keep the lid off, allowing the chicken to cool to room temperature. Once it is cool, cover the pan and place it into the freezer. Once frozen, it should keep well for at least 2 or 3 months. If you don’t plan to freeze it, keep the dish in the refrigerator and use within 4 to 5 days. 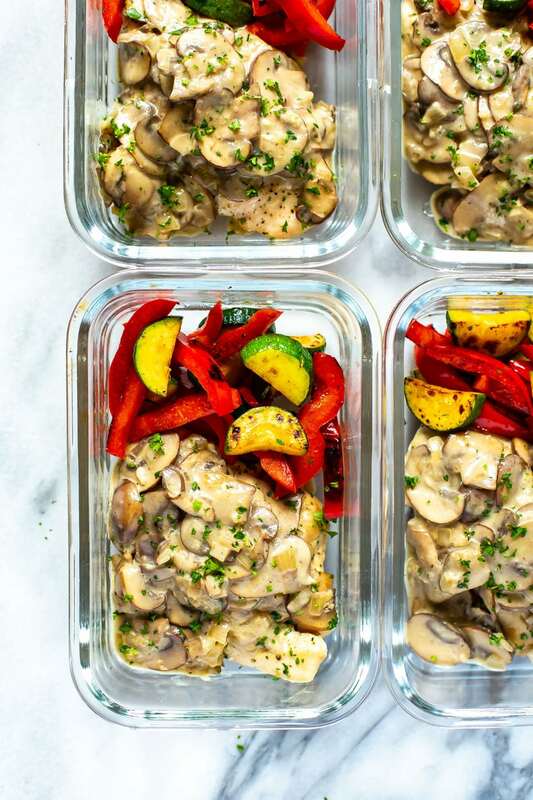 Grab some glass meal prep bowls if you plan on turning this Chicken Marsala into your weekly lunches. 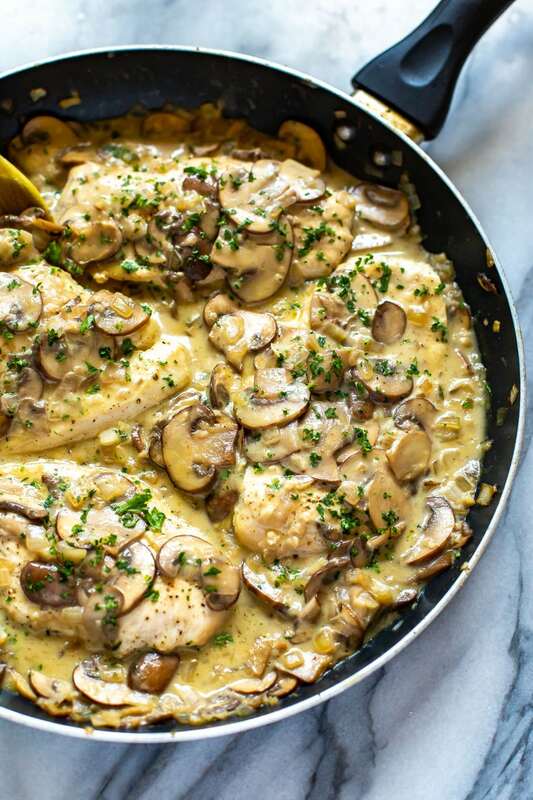 This Skinny, Easy Chicken Marsala Skillet is a delicious, creamy mushroom chicken recipe and it's made healthier with less cream and marsala wine! Preheat olive oil in a large skillet over med-high heat. Add chicken cutlets and season with salt and pepper, then cook for 4-5 minutes each side until you get a good sear. Remove from heat and transfer to a plate. Without wiping skillet clean, add mushrooms, sauteeing 4-5 minutes until juices start to release, then stir in onions and garlic, sauteeing another 2-3 minutes until onions are translucent. Add in wine and let reduce for 1 minute, then stir in flour. Add chicken broth and chicken back to skillet. Bring to a boil and wait for mixture to thicken slightly, about 2-3 minutes. Stir in cream and cook another minute before removing from skillet. Plate chicken mixture and then add zucchini and red pepper to skillet, sauteeing for 4-5 minutes until veggies are tender. 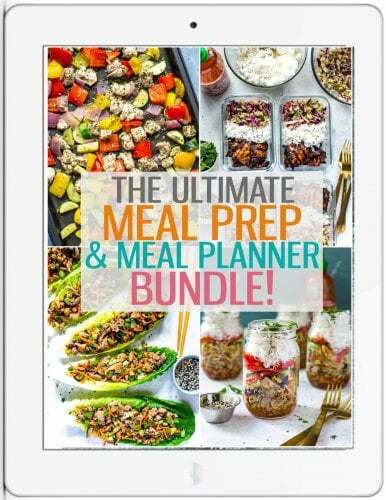 Add to plate or meal prep bowls with chicken then serve and enjoy!